The Product - Golf Warm-Up! 5 Minutes to Tee-Time™ is more than a list of recommended stretches/flexibility movements; it’s a structured golf warm-up. 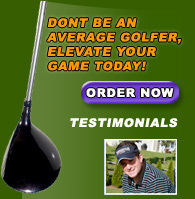 The product is a professional manual that takes you step-by-step through a series of golf specific flexibility and conditioning movements preparing your entire body to contribute to a fluid golf swing from the first tee. By implementing a series of safe (and simple) flexibility and conditioning movements, you can experience impressive results. Even though it takes only 5 minutes (it really does), you will be impressed with just how engaged your body becomes (muscles warm, elevated heart rate). The manual contains four equally important components; upper body movements, mid-torso movements, lower body movements and concludes with a functional swing segment. The movements are designed to be performed in a specific sequence so it is important to follow the sequence for maximum benefit. Included with the program is a special product aid. We have developed a unique bag tag that acts as a supplement to the professional manual. 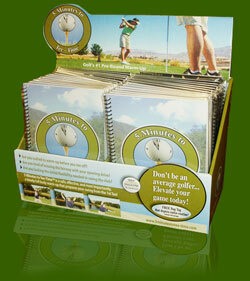 The bag tag depicts the entire routine visually in small thumbnail pictures for easy reference at the golf course. 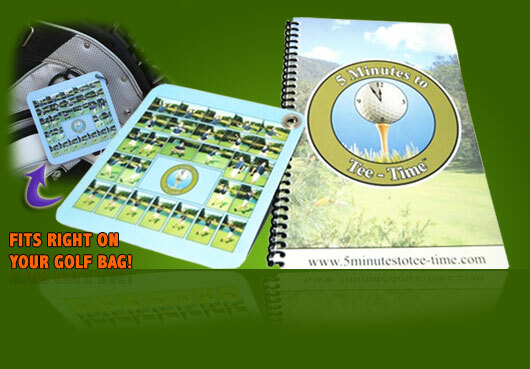 The premise is once you understand the routine and can perform the golf warm-up safely on your own; the bag tag is your quick, easy reference guide if you need help remembering any of the movements.